To allow quick and efficient drying of seed or grain to a low moisture content, the incoming air must be sufficiently dry. When the condition of this air is not optimal, the drying process will take too long and the desired moisture content of the seed will not be reached. By drying the air first, the moisture content of the air is reduced and the air will be able to absorb more moisture from the seed. grille and above it the exhaust duct with fans. A method to extract moisture from the air is through condensation. Air contains energy; A part is used to keep water molecules in the air (moving), the rest (free energy) warms the air up. When we take energy from the air, the free energy decreases first and the air will cool down. After the free energy is extracted, the energy for the water molecules will decrease. These molecules then descend like water droplets at the coolest spots. Example: air of 27°C (80.6°F) with an RH of 60% contains 13.6 grams of water per kg (approx. 1.15m³) air. By cooling this air to 19°C (66.2°F) the free energy is extracted and the moisture can still remain in the air; the RH rises to 100%. When more energy is extracted, less moisture can remain in the air and the moisture will condense; the air becomes drier. At 6°C (42.8°F) the air can still contain a maximum of 5.8 gr of moisture. In this way the moisture content is reduced by almost 8 gr / kg of air. 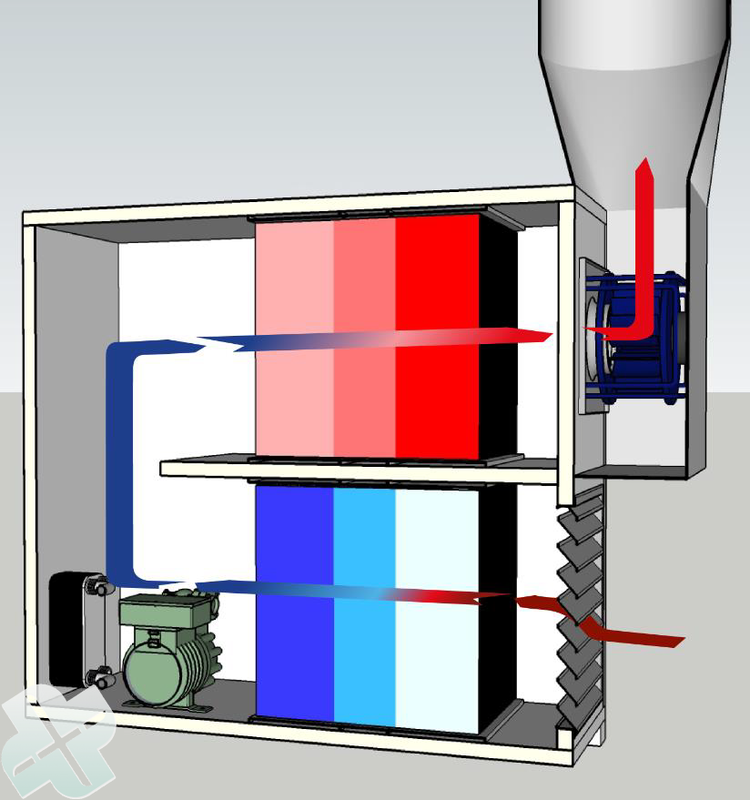 With a heat pump, the extracted energy can be delivered to the same air again. This extra energy then ensures that the air warms up and more moisture can be absorbed; the RH drops. Example: when the air with 5.8 gr of moisture is heated up to 27°C (80.6°F), the RH will drop to 25%. With this air, moisture can quickly be extracted from the seed and the seed will be dried to a low moisture content; carrot seeds down to 7% and wheat to 8.5%. 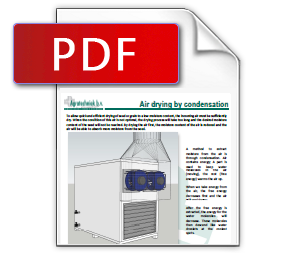 With the Agratechniek Condensation Dryer (ACD) installation, the incoming air is cooled down considerably. Condensation makes the air drier.The air is then reheated to the desired temperature and blown towards the drying installation. Where the air is used to dry the seed. 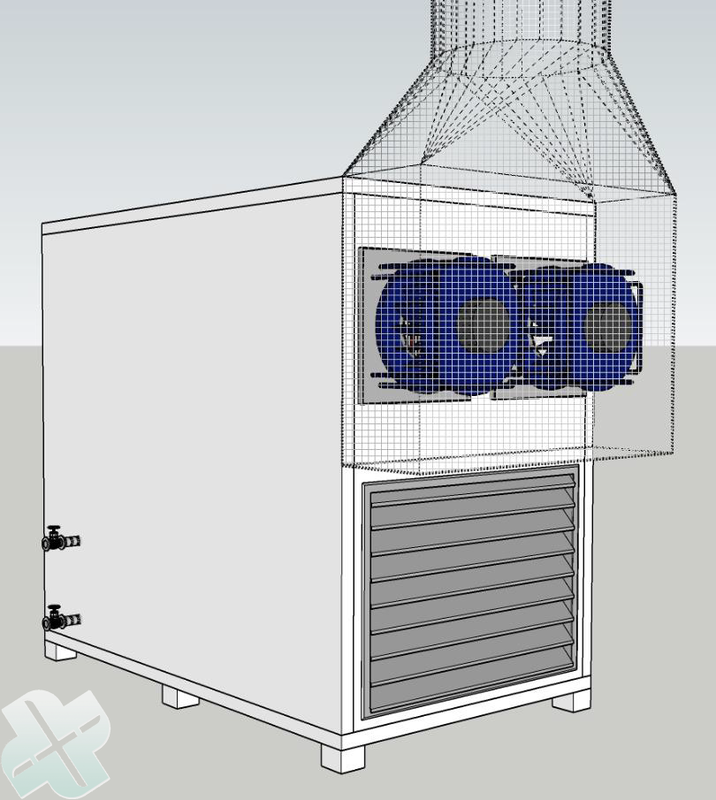 The ACD installation is designed in such a way that the air can be cooled down considerably, with relative small compressor capacity; from 35°C to 6°C. The air then contains 5.6 gr of moisture. With this drier air, less energy is needed to keep the remaining water molecules in the air. So there is energy left and that energy is released in the form of heat. For the drying of seed, both dry and cool air is preferred. This means that not all energy may be released into the air after cooling. In ACD installations, excess energy is drained via a heat exchange unit by a hot water circuit. Connection on the side. The air is then drier and has a lower temperature. It is possible to use the hot water in the drying installation or for other purpose. The ACD installation is controlled by the ABC processor. The desired air moisture content and the desired temperature are achieved automatically. With the ABC central air control, the dried air is then released where it is needed at that moment. For each drying section, it is automatically determined whether the extracted outside air needs (extra) dry air. If necessary, dried air is added. Thanks to the ABC central air control, the investment made for an ACD installation quickly becomes profitable. The same ABC control can redirect the excess energy to where it is needed or can be used. That saves a lot of energy. • The ACD installations are available in different capacities; 25-150 Ltr/h. • The ABC central air control makes one ACD installation much more cost-effective than several small air dryers. • The amount of dried air is variable. • The temperature of the dried air is variable; it is possible to dry with colder air. • Outside temperature of e.g. 35°C (95°F) can be cooled to 25°C (77°F) and dried by 30%. • Thanks to the unique configuration, an ACD installation requires relatively little electricity. • The ACD installation is movable and easy to install (plug and play). • The released excess heat is removed with a heat exchanger. • This heat can easily be used for other purposes or be blown outside.